It's been a while since we talked skin care. My sincerest apologies - after my holidays came some pretty busy work times and although I always promise myself not to forget about the blog, I just kinda do when I get home at 2AM with a 7AM wakeup call. Yikes, I know! Speaking of which.. It takes some good skin care to help your skin combat those short nights and stressful days. Stress basically has two ways of showing on my skin: my dark under eye circles get even worse & I get pimples where I usually don't get them, like on my cheeks and temples. 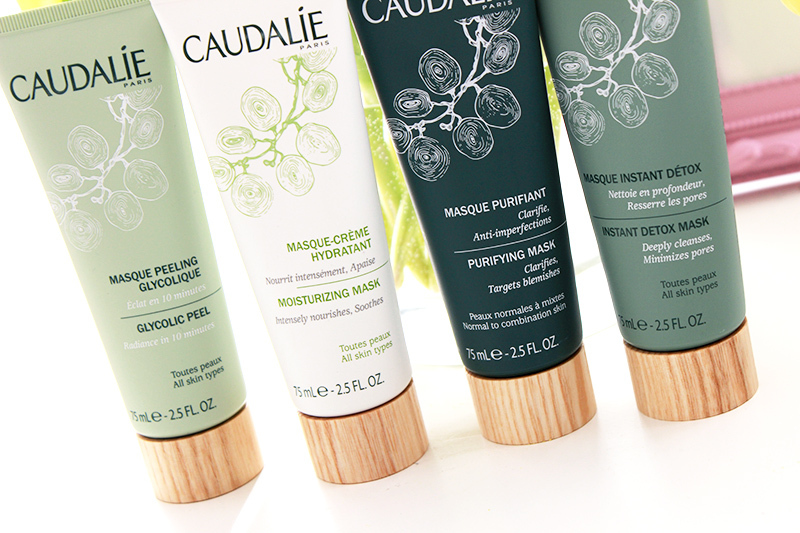 These new wonder masks by Caudalie are coming to the rescue! 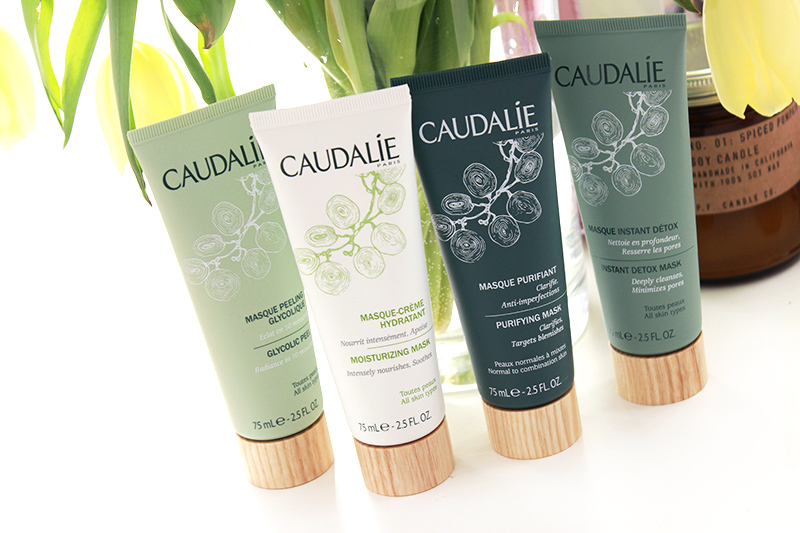 Caudalie recently revamped their face masks and I gotta say: I'm impressed. The masks come in a hygienic squeeze tube with a wooden cap - I really like the new branding! There are four masks in the collection and they're all meant to be used together, each with their own specific function. There's the Glycolic Peel for bright and radiant skin, a Moisturizing Mask to relieve dehydrated skin, a Purifying Mask to clarify and target blemishes and a Instant Detox Mask to deeply cleanse and minimise pores. None of these are overly drying or irritating, Caudalie is a beautiful brand that really understands the balance of your skin. Nobody wants a burning sensation on their face to get rid of impurities, right? The Glycolic Peel (first from left) is a very gentle peeling mask formulated with glycolic acid, viniferine and papaya. Viniferene is an ingredient patented by Caudalie that is said to be 62 times more efficient at battling pigmentation than vitamin C, while papaya and glycolic acid also gently exfoliate the skin and take away dead skin cells so your skin is ready to radiate again. Unlike other chemical peels, this one is very gentle and the perfect mask to try out this type of chemical exfoliation. You can use it twice a week, although I just use it once a week as I also use an exfoliating toner. The Moisturizing Mask (second from left) is a very creamy, comfortable rehydrating mask that'll quench your skin in no time. It's formulated with hyaluronic acid, grape seed oil & Vinolevure. It can be used as a mask or as an intensive night treatment. When using it as a mask you apply a thick layer to your the skin (avoiding the eye contour area), wait about 15 minutes and then tissue off whatever your skin didn't absorb. As an intensive night treatment - recommended for very dry skin types or after a day of intensive sun exposure - you apply it as you would your night cream. My favourite way of using this one is definitely as a mask because of my combination skin, although I do see myself using this at night once or twice a week during the winter time! 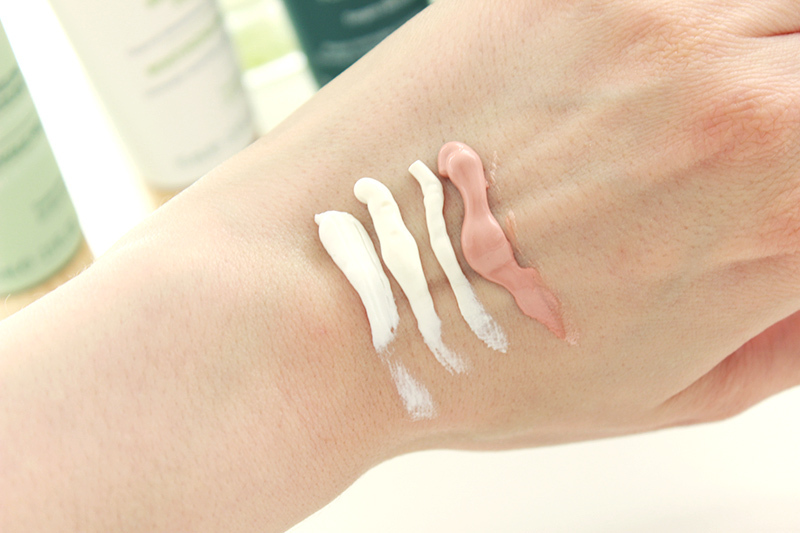 The Purifying Mask (second from right) is an absorbing but still non-drying mask that is perfect for oily skin types. Formulated with white clay, zinc and a blend of essential oils (like sage, lavender, bergamot & camomile), this one will cleanse and rebalance the skin. The essential oils smell wonderfully comforting too! You can use this one twice a week on any oily zones on your skin - for myself that would be my T-zone. Feel a break-out coming? This one is your pimple's biggest enemy! I like to dry out pimples before they can cause a big scene and this is the perfect accomplice. 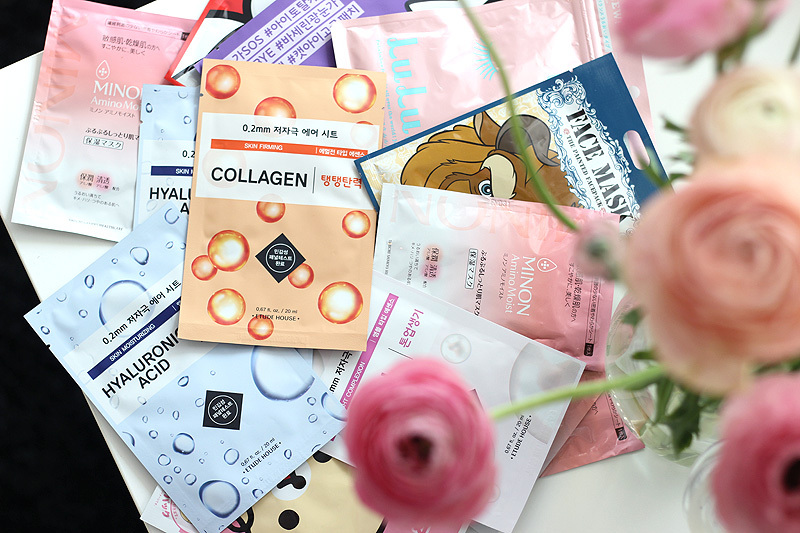 The Instant Detox Mask (first from right) is your go-to mask for when you're battling stress and have tired skin with impurities to show for it. Formulated with pink clay, grape marc, coffee extract, papaya enzymes and that same blend of calming essential oils we found in the Purifying Mask. This powerful antioxidant blend of ingredients will get rid of toxins and protect your skin against free radical damage. This one is quick to act and needs just five minutes to work, although ten minutes is always better. The pink clay will dry completely and then needs to be removed with lukewarm water. I prefer a using a steaming hot cloth for the removal process - so comforting! My favourite mask of the bunch is without a doubt the Instant Detox Mask. I love how quick and easy it is to use! 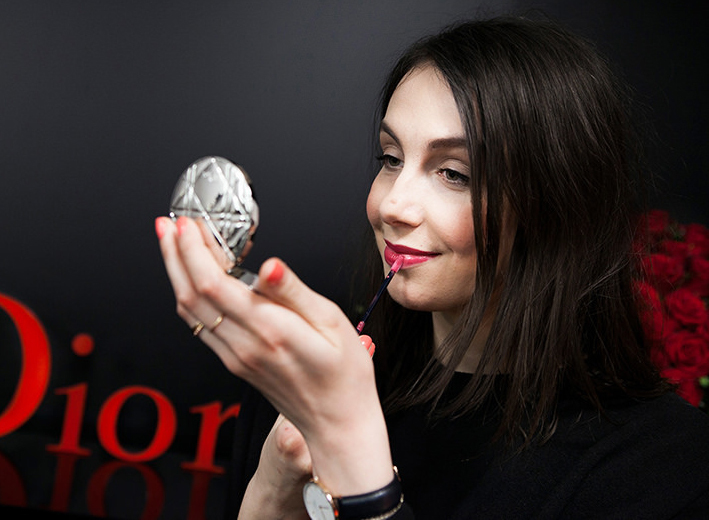 I apply a thin layer with a flat synthetic foundation brush, leave it on between 5 and 10 minutes depending on how much time I have and immediately see a difference after taking it off. What a true gem! If you only have the budget to buy one, or you're simply a one-product-kinda-gal, then I'd definitely suggest this one. In case you're after two, I'd also throw in the Glycolic Peel.